As a Personal Trainer and Nutritionist, my goal is educating while leading by example. Healthy lifestyle or not, chronic stress can destroy your overall well-being. For the last decade, my journey could be described as divorce drama, worthy of a Hollywood blockbuster movie. This is not a pity party. I am content leaving the past where it belongs. Surviving a string of struggles was painful. Chronic stress leaves its mark on my health. This is a glimpse into my journey. A lifetime of consistent healthy choices thanks to an early start courtesy of mom, helped me navigate through many emotional storms. For many years, I have followed a clean plant-based whole food diet, discovering sensitivities years before alleviated digestive issues. Loving the gym didn’t hurt either. To this day, weights, boxing and lots of cardio minimize life’s ups and downs. Quality bonding time with my sons is spent being active. Adorning lavender scented eye mask in a cool dark room for eight restoring hours of beauty sleep helped me realign. Homeopathic and herbal remedies were my go-to. I am self- proclaimed health nerd. I truly thought, I had it all under control. My life was eat, sleep, train and a side of supplements. Unfortunately, signs of stress were slowly but surely taking their toll. I couldn’t hide it anymore. Who was I kidding? Mentally, physically and emotionally exhausted, stress was winning the battle, and I hadn’t realized how that was impacting my thyroid, and my health. I COULDN’T get sick! I didn’t have time. My single mom life revolved around juggling school, work and my sons. I was constantly on the go, assuming my body would adapt. Even the best laid game plan is not enough once you make the big leagues. My stress was ‘Super Bowl’ status! On June 27, 2016 everything changed. With my clients away on holidays, my day began cat-watching and watering their urban patio garden. Enjoying breathtaking panoramic view of Toronto, I began polishing an Ayurveda paper for school. Suddenly, panic set in. Overwhelmed, my mind was racing and my chest tightened. I couldn’t catch my breath. This wasn’t new, but this was atypical to say the least. Tears streaming, grasping the railing, I found myself leaning over the balcony seriously contemplating the unthinkable. Not sure if it was lavender tea, surge of vitamin D sunshine or the call to a friend that kicked me out of it, but it marked day one of becoming my own client! After decades of healthy habits, I was falling apart. Twenty pounds had crept on. My period was gone for over a year. Chest pain, joint pain, edema, dry skin, tinnitus and brittle breaking hair were commonplace. My migraines were debilitating. I am very much against pharmaceuticals but medication was the only source of relief. The strength of just one $18 sublingual pill is mind-blowing. Within five minutes, I’m out cold for hours. Lights, sounds and smells were overwhelming most days. I was so depressed and fragile, hiding behind my smile was a full-time job. I truly had nothing to be sad over. Stress was constant but it hadn’t worsened. School, kids, work money and trips to family court were daily run-of-the-mill stress. I believed I was managing. My body had news for me. Ignoring signs and symptoms for so long, the universe finally gave me a scary wake up call. Staring over the ledge shook me to the core. It was time to take action. Step one began with an official visit to my family physician. He agreed something was not right. NO KIDDING! He quickly referred me to a Gynecologist and Endocrinologist. Waiting months gave me ample time to fill out a slew of my own personalized client intake forms plus the detailed Nutribody questionnaire. What an eye opener! My health didn’t deteriorate overnight and restoring balance would require patience – a lot of patience. All my blood tests were in the range of normal! Normal? I can assure you, I was not feeling, looking or acting normal for me! The doctors were puzzled to say the least. After endless tests, I was grateful cervical cancer was crossed off their list of concerns. Thyroid tests revealed nothing outside medical definition of normal. However, testosterone was low, leaving hormone replacement therapy (HRT) as their only solution. Experts laughed at my adrenal fatigue theory. After months of appointments, I was still depressed and desperate to find resolve. My long list of symptoms fit a very common and yet under diagnosed issue- hypothyroidism. My thyroid by all accounts, appeared to be under-active, regardless what hormone testing revealed. It’s interesting to note, many people with under active thyroid have normal levels of thyroxine (T4) circulating in their bloodstream. Producing T4 is not always the issue. Conversion to T3 may be the point of contention. Leaving cells starved, the body chooses survival and begins conserving therefore not all functions receive enough hormone. Maintaining the body in balance or homeostasis is impossible. My plan was to trick my body out of this new normal way of doing business. In my mind, it was two-fold. Under stress, adrenal glands secrete cortisol, often referred to as the “stress” hormone. Keep in mind cortisol inhibits conversion of T4 to T3. Throw in a lack of iodine and amino acid tyrosine for binding, thyroid function can be compromised. I believed this crucial conversion to be my primary issue. 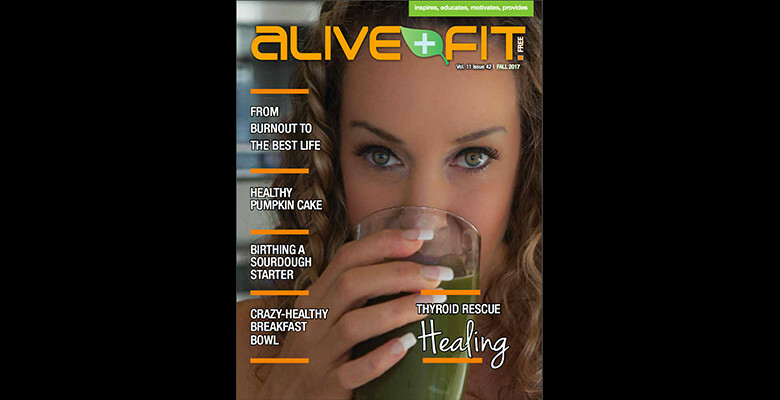 I have no doubt, my under- active thyroid was linked to exhausted adrenals. 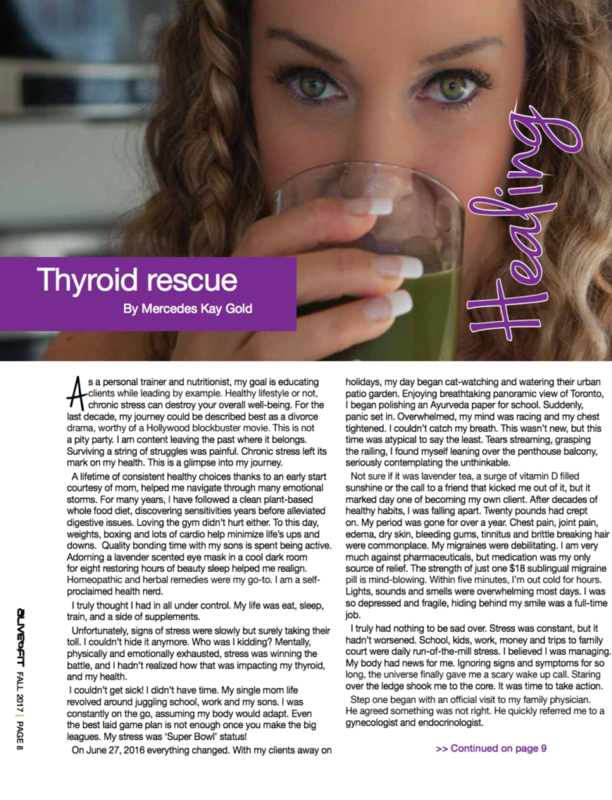 Treating adrenals along side thyroid was the way to go. BACK to BASICS meant increasing nutritional support. Meal planning would receive special attention. Managing deficiencies would help kick -start the thyroid! Selenium, zinc, iron, iodine, vitamin D, B6, B12 are all co-factors required for healthy thyroid function. Although animal sources would provide required nutrients, I chose to continue plant-based meals. Adding sea vegetables such as dulse, wakame, kelp and nori increased iodine naturally. The thyroid is home to the largest iodine concentration, yet not conserved by the body. The cupboard was now stocked up on individualized portion- controlled sea weed snacks. Brazil nuts, pumpkin and sunflower seeds provided trace minerals lost in today’s over-farmed land. Seeds also provide tyrosine, an amino acid or building block of protein. A superb salad topper and a spoonful of seed butter satisfies late night snack attacks. Collard greens were my official low calorie wrap while mushrooms were added to all dishes for Vitamin D. Don’t forget, anyone living north of the equator should also supplement. Check with your medical practitioner on appropriate dosages. B12 was tricky. Since it’s found only in animal foods, adding a sublingual was required. In the past, iron supplements have caused constipation. I added gojii powder and berries anywhere and everywhere! Steamed spinach with lemon was a common sidedish, too. I temporarily eliminated vegetables from the brassica family, raw or steamed. Brussel sprouts, kale and broccoli were hard to omit. Luckily, I was super sensitive to a couple key foods in the goitrogen family! Be mindful in meal planning as peanut, soy and millet can also play havoc with thyroid function. Mini lifestyle choices were maintained. Continuing with natural toothpastes and water filters remained important. Chlorine, fluoride and bromine compete with precious iodine. Avoiding chlorination in pools and jacuzzis wasn’t easy. Supplement support was next crucial part in helping kick start my thyroid! I built my thyroid formula using minerals, vitamins, amino acids and herbs such as copper, selenium, tyrosine, vitamin B6 and ashwagndha to name a few. The obvious signs and symptoms were connected to hypothyroidism or under active thyroid BUT the root of the problem appeared to be exhausted adrenals. How well adrenals function is directly correlated to quality of life. They are responsible for a long list of physiological processes in the body. From hormones to blood sugar regulation, even collagen production, adrenals are in charge. Stress, whether mental, sets the body into “fight or flight” mode releasing hormones. Stress releases cortisol and in turn adrenals literally drain Vitamin C.
BACK to BASICS equals choosing whole food plant based, raw, organic whenever possible. It’s not hard! Breakfast was a bowl of sunshine! Kiwi, lemon, grapefruit and oranges boost immune system. I added low-sugar, high-fiber and vitamin C power-packed berries to breakfast smoothies. Throughout the day, green and red peppers were my rainbow of vitamin C.
Vitamin B’s are known as nature’s stress-busting family. My menu included green beans, avocados, lentils, brown rice, spinach and sweet potatoes daily. Zinc and selenium are indispensable for thyroid health, as well as for adrenals. Including nuts and seeds, as well as chick peas was easy, affordable and portable. Hello hummus! Conscious food choices helped increase intake of certain critical nutrients but I was so far gone, needing to pull out the big guns. Vitamin C is water soluble. It’s easily eliminated by the body as well as consumed during stress. I began dissolving high doses of powder Vitamin C into water several times a day. The real difference for me came with the addition of stress-busting family of herbs referred to as adaptogens. I was switching my stack often, favoring tincture form and always adhering to my own tailor-made maximum dose. I love licorice, siberian ginseng, holy basil and rhodiola. Last piece of the puzzle was liver support. Official housekeeper of the body, the liver works overtime filtering toxins. From perfume to pesticides, pollutants are everywhere. The liver is needed to manage estrogen metabolism. My hormones were a mess. The gynecologist was still pushing hormone replacement therapy, convinced I was in menopause. My gut feeling was no, no, no! This is stress, all stress. I know menopause will come and I’m not living in denial. I am approaching 50 years young, and when it begins my newly strong liver will help ease symptoms. We know our liver plays a key role in the conversion of T4 and T3. The protocol meant showing love to my liver with few tinctures of dandelion root, pots of tea and steady intake of milk thistle. I am grateful that after what feels like a lifetime I have a period! I have begun to slowly lose weight. Inflammation and puffiness began to subside. I am back at the gym for me! I am not depressed. As this goes to print, I will be celebrating turning 47 years young and feeling like me again! The take home message is listen to your own body. Normal is ever changing. Living holistic means being mindful, embracing change while still showing self-love. Being open to altering anything and everything is related to discovering what works for your body. Keeping a detailed food, exercise, sleep and supplement journal will highlight potential issues. Travelling such a rocky road led to discovery and recovery. Always learning and growing meant trying new things. To be honest, my morning teaspoon of benzonite clay in water still makes me gag but I’m smiling. My new found affinity for incense, essential oils and occasional sweaty yoga class has me living in an attitude of gratitude. Does‎ this sound like YOU? Take my free ADRENAL and THYROID tests then please call (416)-820-9049 or email me for a free 15 minute consultation. I would love to help! Note: Consult with a health practioner before beginning any new protocol. Mercedes Kay Gold is a Certified Holistic Practioner and Mobile Personal Trainer living in Toronto. Her writing has been featured in various publications and has appeared on Daytime with Jacqueline Betterton. She spends her spare time blogging all things healthy and enjoying spending time with her sons.